I currently have four books sitting in my shopping cart over at Amazon. Don't tell my husband. It would be so easy to push that check out button. The books could be here, sitting at my desk in just a few days. This week even. Each of the books sounds too good to pass up. The reality is, I know I will not get to them right away even if I do buy them. I would log them into LibraryThing and then they would join the other TBR books waiting their turn. It's so tempting though . . . 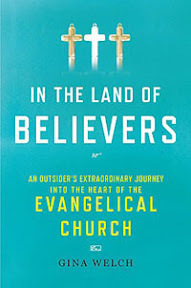 In the Land of Believers: An Outsider's Extraordinary Journey into the Heart of the Evangelical Church by Gina Welch ~ Books that explore religion have always intrigued me. In this book, the author, a secular Jew, goes undercover to learn about the Evangelical Church. If Rebecca's review hadn't convinced me that I must read the book, Amy's and Florinda's did. It also goes along with that themed month I've been planning for about a year now--the one that has yet to come to fruition, where I read the religious based memoirs in my TBR collection. 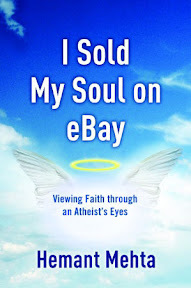 I Sold My Soul on eBay: Viewing Faith through an Atheist's Eyes by Hemant Mehta ~ This one popped up as a book people bought who bought In the Land of Believers, and it caught my eye. The author held an auction on E-Bay, agreeing to go to the church of the highest bidder's choice. The winning bidder requested that Mehta visit a variety of different churches, and the book is a written account of the author's experiences visiting those churches. Another one of those books that would be perfect for my religious based memoir themed-month. If I ever actually get around to it. 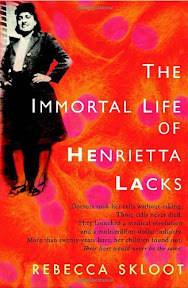 The Immortal Life of Henrietta Lacks by Rebecca Skloot - I had read a blogger review of this book not too long ago (I wish I could remember where) and then came across it in the most recent Bookmarks issue. Henrietta Lacks died of cancer during the early 1950's. Unknown to her or her family, doctors took a sample of her tissue for research, tissue that became the first viable cells which would go on to aid scientists and doctors in making important and life-changing medical discoveries. The book touches on the science as well as the more personal story of Henrietta and her family, then and today. 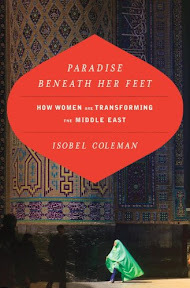 Paradise Beneath Her Feet: How Women Are Transforming the Middle East by Isobel Coleman ~ I came across this title quite by accident. One day last week I was reading the headlines and followed a link over to a NPR podcast featuring the author Isobel Coleman. She, along with Sakeena Yacoobi, the founder and director of the Afghan Institute for Learning, were being interviewed on Talk of the Nation. Paradise Beneath Her Feet is a book that focuses on how a few women are using Islam to change the role of women in Islamic societies, using faith to support and empower women in becoming educated and taking a more active role in improving those societies. Now you can understand why it's so hard to resist hitting that check out button. What books are tempting you these days? Are there any you are trying hard to resist for the time being? As for what I am reading now, I currently am enjoying my first John Sanford crime fiction novel, Mortal Prey. I have been saying for years I wanted to read one of his books. Sometimes it takes a nudge from a friend and a book tour to do it. The unthinkable happened one day last week. I left my book at work. I went back and forth about how to handle the situation. I have been meaning to get to Valley of Death: The Tragedy at Dien Bien Phu That Led America into the Vietnam War by Ted Morgan and considered picking that one up to start on. The size was a bit off-putting though, at least right now. I thought about my stack of magazines I'd fallen behind in reading, as well as those short story collections I want to read, in particular A Touch of Dead by Charlaine Harris. Finally, though, I decided to read Scalped by Jason Aaron and R.M. Guéra, a graphic crime fiction novel set on an Indian Reservation. I was reading the introduction of Scalped and saw mention of another of Jason Aaron's books listed, The Other Side, set in Vietnam during the Vietnam War. Hmm. Wouldn't that make a good reading choice for the Vietnam War Challenge? A graphic novel would be a perfect fit in between a couple of the other rather long books I have on my stack for the challenge. I commented as much to my husband that night and then he surprised me later in the week when he pulled a copy of The Other Side out of his bag. He's so thoughtful! I look forward to reading it for the challenge. I can hardly believe it is already May! As you can tell from this post I've got nonfiction and reading challenges on my mind. The Sookie Stackhouse Challenge will be wrapping up the end of next month and I already have my order in for the latest book in the series. I should be able to fit it in before the deadline. And while my reading choices for the Vietnam War Challenge seem to be diverging from the list of books I was considering reading for the challenge, I am still aiming to complete the challenge by the end of the year. I hope you will join me later this week! I will be highlighting my day at the Los Angeles Times Festival of Books, reviewing The Killing of Mindi Quintana by Jeffrey Cohen and Beautiful Assassin by Michael C. White, and confessing my true feelings about fish. Enjoy the week and happy reading! Hm, what is tempting me at the moment? Mount TBR, all of it, to be honest. I'm currently reading this first Flavia de Luce mystery and even though I'm not that far in yet, I already want to order the second one... Oh, the life of a book lover. And I know the Amazon problem. It's just too easy to click 'add to the cart', isn't it? The Immortal Life of Henrietta Lacks was a good one! I'm writing my review now actually. Looking forward to your recap of the Los Angeles Times Festival of Books! When you wrote, The reality is, I know I will not get to them right away even if I do buy them. I would log them into LibraryThing and then they would join the other TBR books waiting their turn. , I thought, "that's me!" I've been working very hard to resist temptation myself -- the used bookshop is my weakness -- because I realize I'll do exactly what you described. And I also know I can find most of what I'd like to read at my library. I've been doing better at the resisting thing recently, but it's an ongoing thing! Wendy....where have you been? You were missed; hope all is well. I loved The Immortal Life of Henrietta Lacks; amazing story. Have a good week Wendy. You have been on my mind Wendy! I haven't seen you around, and hope everything is OK. I posted yesterday on "Wants and Needs", and Henrietta was on that list. There are so many books I feel like I HAVE to read. My summer is spoken for before I've even started! I think the best book I've read so far this year (which I reviewed last Friday) was Let the Great World Spin. It blew my mind, seriously. If I ever saw Colum McCann on the street, I might just throw myself at him. All of those books sound wonderful! I have held many a book in the Amazon cart waiting for the right moment to "click"
That first book does look really fascinating. Years ago I read a book that sounds ridiculous and it was really more like an encyclopedia, but I found it fascinating--The Handbook of Denominations in North America or something like that. I'm probably really weird but I find that kind of thing intriguing! Oh there are so many books tempting me, so I know how you feel. I've read Henrietta Lacks and can tell you it's well worth reading - it's very thought provoking. I'm reading The Danish Girl right now and it's interesting - I'm not quite sure how I'll feel when I'm done. Push the button for Henrietta Lacks! It'll be worth it...I thought it was an amazing book. It's well written, and the story is incredible. I'm so glad to see you back here, Wendy - and so sorry we were at the Festival of Books on different days! Better luck next year :-). I'm glad you're interested in In the Land of Believers - it certainly gave me a lot to think about. Religious studies - including memoirs - is a favorite reading interest of mine too. I totally understand the "buying books and not getting to them" thing - I'm quite good at that myself. Right now, I'm not being seriously tempted by anything; TBR is starting to intimidate me. Ask me again in a couple of weeks, though :-D.
I have a few sitting in my shopping cart right now too that I REALLY, REALLY would love to get my hands on. The main one is Dead in the Family by Charlaine Harris. I've read the first three of Sanford's Prey books and I still occasionally think about picking up the others though it's been three or four years since I read the last one. Right now I'm reading Child Star by Shirley Temple Black, The Stephen King Illustrated Companion, and White Witch, Black Curse by Kim Harrison. So far I'm not doing too well with most of them. Susi - I know that feeling well too! There are times when everything in my TBR collection sounds so good, and then I have trouble deciding what to read next. I haven't yet read the The The Sweetness at the Bottom of the Pie, but it's one of the books in my TBR room waiting its turn. I am glad you are enjoying it so far. I hope you have a great week too. Thank you for stopping by my blog! My weekend has been nice--busy, but nice. Yesterday we attended an air show at a local military base. It was so crowded, but we had a good time. My work office is near the airfield and I had gotten to see some of the practice runs all last week as the jets prepared. Today I hope to be lazy and read in between loads of laundry. Meghan - The Immortal Life of Henrietta Lacks does sound good. I look forward to reading your review. Laura - My local used bookstore closed last year. I really miss it. It never would have carried books like these though, unfortunately. But it was a great source for all the mysteries and paranormal books I like to read. I have so many books in my personal library already to read that I really should resist temptation. LOL It's hard though because I'm always worried if I don't have it on hand, I'll never read it. Not always the most rational thought, I know. Diane - You've got great impulse control! I usually wait a few days before deciding. I even compare prices to see if I can get the books elsewhere cheaper. Sometimes the books go to my wish list (at least when I can convince myself to wait), but other times I cave in to the temptation. The Immortal Life of Henrietta Lacks does sound like an amazing story. I can't wait to read it. Sandy - I did see your post yesterday and thought it was a neat coincidence that we were writing about similar topics. :-) Great minds thing alike, as they say! That's quite an endorsement when you want to throw yourself at an author. LOL I'll have to look for Let the Great World Spin. So good to see a new post from you Wendy! I am being tempted by a lot of books. I recently saw that The Little Stranger by Sarah Waters is out in paperback and I really want it. We'll see how long I can hold out. Ana - The City & the City is on my wish list. I've been waiting for it to come out in paperback before I buy myself a copy. I haven't read anything by China Miéville and so that will probably be my first. Preparing for a move is a good reason to cut back on the TBR pile. I should follow suit, but since my move date is still up in the air, it's hard to think it as actually happening. Molly - It's so easy to do too! I don't know why I didn't just put them on my wish list. It'd be a little less tempting to buy them "now" that way. Kathy - I am glad you enjoyed The Immortal Life of Henrietta Lacks and found it thought provoking. It certainly sounds like it would be! I've been wanting to read The Danish Girl and look forward to your thoughts on it when you finish. Jill - Haha! The Immortal Life of Henrietta Lacks seem to be the most popular today. :-) I definitely do want to read it. Florinda - I've been to a couple of Evangelical Churches over the years, going with a friend and once with a church group. And I work with people who are of that particular denomination. So, I think it would be interesting to read about Welch's experiences. I feel that way sometimes too, overwhelmed by my options. I really need to cut back on my TBR collection. Next year we'll definitely touch base at the book festival! No musicals in April that year. Jen - It's so hard to NOT push that check out button, isn't it? I pre-ordered the Charlaine Harris book already (couldn't beat the $9.99 price!) and am expecting it later this week. It'd better come! I can't wait to read it. I'm really enjoying the John Sanford book. I'm not sure it was the best book to start with, being the 13th book and featuring a villain who I have a feeling appeared in an earlier book. I should have been more careful in my research. You've got some good books going! One of these days I really will read Kim Harrison's series. Really, I will. The Little Stranger is one I want to read too. There are a few books that are coming out in paperback soon that I have had my eye on. All four of these sound really good so I'm not sure how you are able to resist :) I've been trying to figure out which nonfiction book I want to read next as well. Have a great week of reading! The Henrietta Lacks book is incredible, fwiw. Hemant - I definitely am interested in reading your book, and so I imagine I will be buying it soon. :-) Thank you for stopping by! GeraniumCat - It was hard to limit it to four, believe me! LOL I'm also fighting with myself over whether to buy them now, with some in hardback, or put them on my wish list and wait for the paperback. That would be the smarter move. Unfortunately, I'm not always the brightest though. Yvonne - I have a feeling a Nook or another e-reader would cause be a lot of trouble in terms of not being able to avoid temptation. At least for me. So easy to buy them, and then have the books appear instantly! Your temptation books look like such interesting reads. I've seen the Henrietta Lacks book - I've got it on my wish list. I've read all the Prey books except the last - it's a series I very much enjoy. Right now I'm reading The Kitchen House and it's really good! Nice to hear from you again, Wendy! Those books you've got ready to buy sound so thought-provoking! I should read more nonfiction but, somehow, just stick with fiction. I guess I like to escape reality! I've never read a graphic novel, either! Maybe one of these days. An airshow? Cool. My husband and son ran a small airport and gave aerobatic rides in a WWII Stearman above town as well as glider rides around Mt. Washington so, it was like an airshow every day. I had the same to check out or not to check out dilemma recently. I LOVE Powell's online, and I put several books into my cart, then felt too guilty to actually purchase them, since my husband hasn't been working. So I left them in the cart. I just got some birthday money, so I went back to Powell's to spend it, and my books were already there! (And I added more besides.) So I guess my retail therapy will be limited to adding books to my cart and then saving them for later when I actually have the money! Wow, that Middle Eastern book sounds SO GOOD! Thanks for the heads up :-) Yay, women!! Donna - The Immortal Life of Henrietta Lacks is definitely making the rounds recently. All the positive reviews from fellow bloggers are making me want to read it even more. I do plan to read more of Sanford's series after having read Mortal Prey. I'm really enjoying it. Linda - I don't read enough nonfiction either. Like you, I tend to gravitate more towards fiction. How cool that your husband and son ran a small airport and gave rides! I would have loved to do that. Lexi - Powell's is awesome! I like that we can buy used books and new books together and not separately like you do with some of the other bookstore sites. Yay for birthday money! I am glad you were able to get the books you wanted after all. Yvonne - One of the reasons I've ruled out getting a Kindle is the lack of ability to get e-books from sources other than Amazon. I think it's great that you can get the e-books from your library for the nook. Aarti - Doesn't it though? I really want to read that one! Marie - Skloot's book does seem to be everywhere, doesn't it? It's getting a lot of good publicity. Hopefully we both can read it soon! Heehee, I have a secret shopping cart waiting for me as well! Sometimes the urge to buy new books is just too strong to ignore! And I'm sorry to hear about you having left your book at work. I know I would just be squirming if that happened to me. I like all your choices and hope that you can pull the trigger on your order very soon! So funny - The Immortal Life of Henrietta Lacks is in my shopping cart, too (along with a few others)... but I will not push the button this week. I bought 9 books at The Strand in NYC a coupe weeks ago! Heather - I was so frustrated when I realized my book was still at the office. I nearly drove back to get it but realized that might be a bit much. JoAnn - I probably shouldn't push the button this week. Or at least wait until the middle of the week when I get paid. I just bought a bunch of books at the LA Times Festival of Books. you'd think that would suffice for awhile. Julia - I haven't yet hit that check out button, but I'm still considering it. LOL I really shouldn't spend the money, especially for the hard cover books. I hate it when I buy a book in hard cover and then only get around to reading it around the time it comes out in paperback. That seems to happen more and more these days. Thank you for the good luck wishes! I hope to get to another of my Vietnam Challenge books this month. Not sure yet which one though. So many choices! this book: The Immortal Life of Henrietta Lacks by Rebecca Skloot is very tempting after all the great reviews I saw online from those book bloggers...I've resisted temptation so far. My shopping cart at Barnes and Noble keeps sending me reminders about what's in it. I added a bunch of books and then just walked away from the session, yet it keeps calling me. I am really in no position to buy any books right now. I have so many that need to be read but the mere act of ADDING them is so comforting. Ti - I actually have the books mentioned in my post in my Barnes and Noble shopping car too. I'm so bad. I shouldn't be buying books either given the size of my TBR collection. As you said though, adding to it is comforting. Hi Wendy, it's nice to see you back here. I was just thinking the other day that it had been awhile since I saw a post from you and I hoped that all was well. You have a great bunch of books you are planning. I really want to read that "I sold my soul on Ebay" that just sounds too good to pass up! A few of your others are already on my TBR. Kathleen - The title alone had me curious about it! I'm still trying to decide if I want to get them all now or save some for later. My carts on online sites are always more of a wish list. I hardly ever hit the order button! Lisa - That's probably the smart way to go. I do use the wish list feature, but sometimes it's easier to put the books in my cart instead. There's always a 50/50 chance I'll move them over to the actual wish list rather than buy them. Hi Wendy! Glad to see you again! I'm currently reading "The Mambo Kings Play Songs of Love" by Oscar Hijuelos. I thought I should read it in preparation of receiving my latest Early Reviewers score, "Beautiful Maria of My Soul" by the same author. It really sounds like I would get more out of the new book if I read his older one first. "Mambo Kings" focuses on the story of two brothers who came to the U.S. in 1949 from Cuba. "Beautiful Maria" is the story from the perspective of Maria, who stayed behind in Cuba. Enjoying it so far. Ooooo ... I've been showing great restraint in the book buying arena, but I can certainly relate to your dilemma! I live in such a small space and the books have just taken over, so I've set up an accountability spreadsheet and tally "books in" and "books out" each month. The "books out" column must be greater than the "books in" column every month; preferably MUCH greater so I can stop feeling so overwhelmed. Terri - I'm always tempted to read a previous book if I feel it will impact my appreciation of the newer book. Sometimes it's possible and other times it's not. It does sound like you made a good choice with Hijuelos' books. I should probably follow your lead and send more books out than I take in. My books have definitely overrun my house. I need to do some serious book weeding.